It’s never easy to assess the middle chapter of a story. The potential of a setup is at least somewhat apparent, and a grand conclusion can sweep the audience away, but middle chapters can falter in so many ways that aren’t even apparent until the story reaches that grand conclusion. In the heat of the moment, sometimes you just have to settle for enjoying what is there, especially the character beats, until you can return with the benefit of foresight and do it all over again. Our crew travels further back through time, to MTMTE #9 and the pre-war time of Shadowplay. Quite literally, in fact—the first two pages of MTMTE #9 are reprinted with only minor changes to color saturation and a dialog box extended to a next-page narration box. It’s always a delight to see pre-war Cybertron, and even more of a delight to see our favorite woobies’ reactions to being back again. Tailgate finally gets an apology for abuse from Cyclonus, spurred on by the beauty of the planet before the ravaging by the Autobot/Decepticon conflict, while Chromedome rides the subway and feels nervous about running into Prowl. Later, Chromedome and Rewind share a few moments by starlight, although a cute moment of bonding is brought down by the realization that maybe they’re not as close as they thought they were—in part due to that whole “parallel universe” thing, and in part due to differing opinions on changing the past. Thematically, Chromedome’s strict adherence to the “no changing time” thing makes a lot of sense—he’s already seen how devastating changing the past for one person can be, there’s no telling how devastating it could be changing it for everyone—but I think Rewind’s tacit admission that they’d sacrifice their relationship with Chromedome to save Dominus Ambus’ life was just as devastating. Earlier, Rung accidentally starts a barfight—the same one he apparently started the first time around, and one Brainstorm knocked out past-Rung trying to prevent, although Whirl taking the opportunity to wreak vengeance against the people who took his hands (plus another bot, just for guilt by association) screws everything back up again. Rung’s appearance is perhaps the most interesting, though, because present-Rung is the one showing up in the pages of Shadowplay. This trip through time seems predestined to happen… although the Lost Light’s depleting quantum engines, Ultra Magnus’ failing memory banks, and the heat death of the universe all seem to indicate the opposite. Through all of this, the crew of the Lost Light (well, OK, Perceptor and Megatron back home while everyone else dicks around in the past) are a step closer to figuring out Brainstorm’s ultimate goal—each jump he’s made has been at a major event in Megatron’s life, and Perceptor posits that fact may even have been a necessity for the time travel to work in the first place. Unfortunately, they’re still a step behind him in actually making those jumps, as the issue ends with Brainstorm aiming (presumably) a handheld weapon at a still-under-construction Megatron’s exposed spark and not another soul in sight. There’s still a lot of unanswered questions, all of them swirling around Brainstorm. For a story driven entirely by his actions, he has remarkably little screen time, although that seems likely to change next time—I mean, how could it not, with it being the climactic issue of this particular arc? 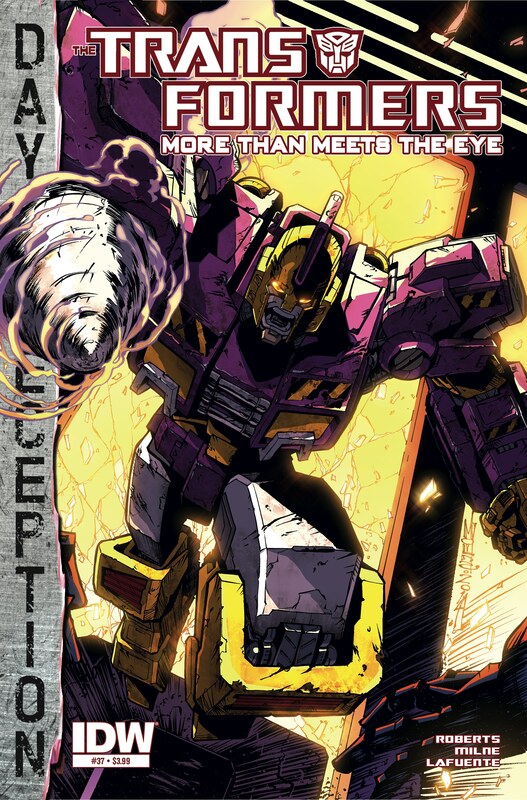 I can’t wait to get resolution on that maybe-a-Decepticon-spy thing, let alone how everyone will react to the realization that maybe a world where the Autobot/Decepticon conflict never happened is just as much of a dystopia as the one where it did. There’s a lot of puzzle pieces in play, and while the past two outings have been loads of fun, Roberts and company have a lot of ground to cover in the conclusion.